Looks even better in person. This album is signed beautifully by Phil and the boys on the front cover in ball point pen. Thank you so much for viewing my auctions. I have been getting autographs in person in the Pacific Northwest for over 2.5 decades. I also traveled frequently over the years to get autographs up and down the west coast and beyond. Couple this with the fact that more and more people simply dont sign or sign very little. This is why only a handful of people do this in each city and is why people who sell real autographs have seemingly high prices. I guarantee everything I sell to pass any reasonable TPA such as Beckett, PSA, JSA or Roger Epperson. For albums I use crush proof mailers and I used chip boards and backers and bubble envelopes etc. Please keep this in mind. Condition and specific item details. I list a lot of stuff guys. It takes a lot of time. I cant always list every single detail so I ask that if you have a specific question about condition or potential minute flaws that you just ask. Getting autographs can be like a scrum and items can get little marks or dents along the way. Usually not, but it can happen. So while 99% of the items are perfect relative to the context, for example a used record is USED!! Some items may have minor flaws so if you are a stickler for details shoot me a message here and I will specifically check for you but it its noteworthy Id be forthcoming or just not list it. This also applies to where I got the item signed. I do not take proof photos. Proof photos are one of the biggest scams in the hobby. 99% of the time they dont show your specific items being signed so they prove nothing other than said person was signing autographs at some point in time. These photos are used repeatedly as a license to forge. People alter these images by photo shopping items into pictures and you can go online and grab any proof photos and use them as your own. I dont wish to make the signer uncomfortable and stop signing, my goal is to get more autographs, not generic images of them signing. Proof photos are big business in LA and NY for example where that photo being a license to forge is more valuable than the autograph itself. NY, LA and the UK are cesspools of the forging empire. The biggest myth in this hobby is that COAs prove authenticity. This doesnt even apply to top TPAs such as Becket or PSA. I regularly see fake times with TPA certs as do I see them fail real items. Authentication isnt an exact science so like any human they often make mistakes. I do not offer TPA certs with my items. I got them signed myself so I know they are real and dont need to pay someone else for their opinion on the matter. If you want a top TPA cert you will need to acquire this on your own at your own cost. Usually quick opinions can be had for a fraction of the cost too. I also do not offer a personal COA. A personal COA is just paper, it has no meaningful power of authenticity on the open market so what is the point? Im willing to give you something tangible but not a homemade meaningless COA. 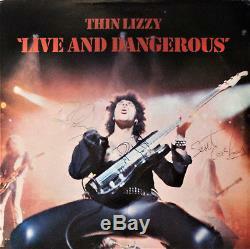 The item "Thin Lizzy Live and Dangerous Vinyl Record SIGNED Phil Lynott, Brian and Scott" is in sale since Tuesday, October 2, 2018. This item is in the category "Entertainment Memorabilia\Autographs-Original\Music\Rock & Pop\Records". The seller is "sodoautographs" and is located in Lynnwood, Washington.